Meat loses 30% of its weight during cooking. This is known as shrinkage and moisture loss. Brining is like a marinade as it keeps food moist and tender. Brining or salting is a way of increasing the moisture holding capacity of meat resulting in a moister product when it is cooked retaining natural juices and adding flavors. 1. Place all brine ingredients in a medium sized stockpot. Boil over medium heat for 5 minutes. Set aside. 2. Place pork chops into the brine and marinate overnight covered inside the chiller. 3. Preheat griller to medium heat. 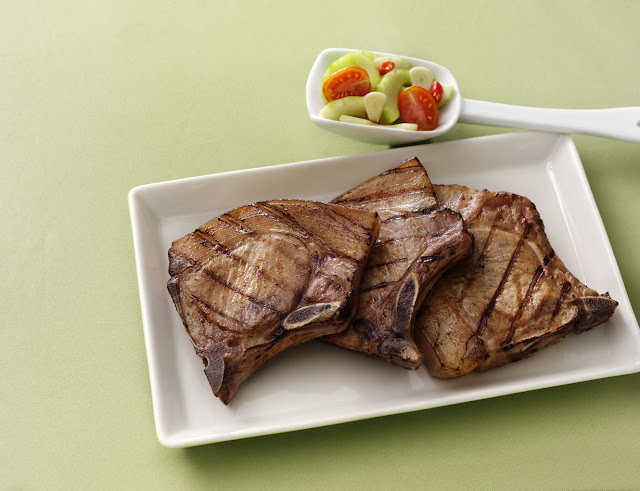 Drain pork chops from brine then rinse in cold water and pat dry. 4. Grill for 15-20 minutes on each side or until fully cooked.